I wrote this to let people know what this album, not only did for me, but can do for everyone else. Hopefully people will buy the album and enjoy it, and maybe it'll touch them in some way like it did for me. opinion, David's taking a big step forward all the way to the other side of down. Just by looking at the CD cover, you can tell David went a completely different direction with this album. Going from almost a death glare on his face, to a smiling David leaning back on a chair, it’s pretty obvious that this album fits his personality better. 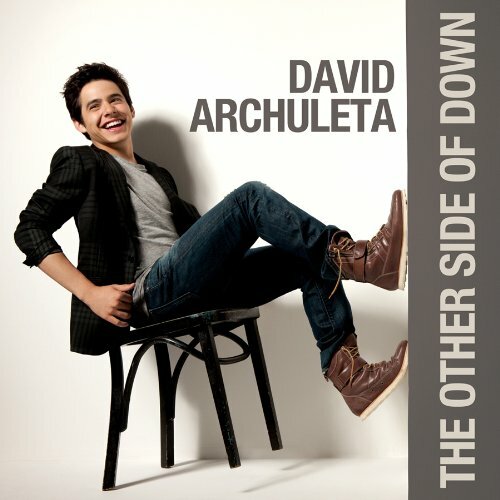 He has said that he wanted this album to introduce people to David Archuleta, and I think he did just that. The fun, quirky "Elevator" and the deep ballad "My Kind Of Perfect" are only two examples of how this album is more "David". "Elevator" was apparently written in 30 minutes, and is about a dream David had, where he didn‘t know which floor to get off on. Though many different opinions flew around about this song, I'd have to agree with the ones who gave it a thumbs up. Even if the song is very simple, there's still so much hidden meaning to it. It’s not necessarily about elevators going up and down, it’s about life. How it’s an endless ride and things are always changing. A dream become reality, and it’s a creative song when you really pay attention to what David’s really saying. "My Kind Of Perfect" is a cute ballad, which David described to be about his future "perfect". David's sensitive and soothing voice will just captivate in this song, and the piano just adds to the adorableness. In other tracks, such as "The Other Side Of Down" and "Who I Am", David talks about himself, and all of his doubts and concerns with life. Though a complicated title, "The Other Side Of Down" is a really meaningful song when you understand it. Basically what he's saying is that he needs to stop worrying in order to get to the other side of down, which is up, which is another way of saying he needs to think of the positive side. It's almost grammatically incorrect, like his old single "A Little Too Not Over You", yet it really makes you think. For "Who I Am", David explained that on his way to that day's writing session, he got stuck in a cab for 2 hours, which gave him time to get his creative juices flowing. "Been two hours in a taxi cab, I'm just driving around and I'm running a tab, But it doesn't really matter, no I'm not getting mad, It's ok cause I know where I'm going". This is one of the realest songs on the album, where he's just trying to figure out who he really is as a person and as an artist. Then there's the more inspirational tracks, like "Complain" and "Things Are Gonna Get Better". "Complain" is one of the two (the other being the ballad “Falling Stars", written by two of the writers who wrote David‘s hit “Crush”) that David didn't pen, but it definitely sounds like David could have written it. The song talks about how even if you don't think things are going too well, you still can't complain, because look at all you that have. David has said those exact words numerous times, and now it's been put into song. "Things Are Gonna Get Better", the most inspirational song on the album in my opinion, has a gospel feel to it, and in it David mentions numerous situations that everyone is in at some point in their life. Feeling hurt, making mistakes, losing a loved one, etc. But the most important thing is that you need to move on, because, according to the song, things will get better. Though it may not always be easy to believe, I think the song really makes you think about your life and the way you may be looking at it. For the time you're listening, it really makes you want to keep thinking "things ARE gonna get better". Other popular tracks on the album are "Parachutes And Airplanes" and "Stomping The Roses", two very well written songs. "Parachutes And Airplanes" (my personal favorite) is a song that really makes you wonder, with it's playful beat and random lyrics. "Thinking about parachutes and airplanes". Just take a second and think about parachutes and airplanes... Does it make you happy? It makes me happy. If it didn't make you happy then you should listen to the song, because it's one of the most creative, uplifting songs on the album that really makes you think. "Stomping The Roses", written by Bryce Avery, then touched up by David himself, is a fun and catchy, yet very realistic song. It talks about someone in your life who just continuously hurts you, therefore, they're stomping the roses. It's very relatable, especially the line "One of those complicated soap operas, I almost felt like I was watching myself", at least to me anyway. So all in all, if you add in "Good Place", the song written about David's career, and the upbeat “Look Around”, about how you should always look around and realize everything you have in life, David's new album really shows you the way David looks at life, with fun, motivating, and different songs. This is something David’s first album didn’t quite accomplish, but I think he’s in for major success with this one.